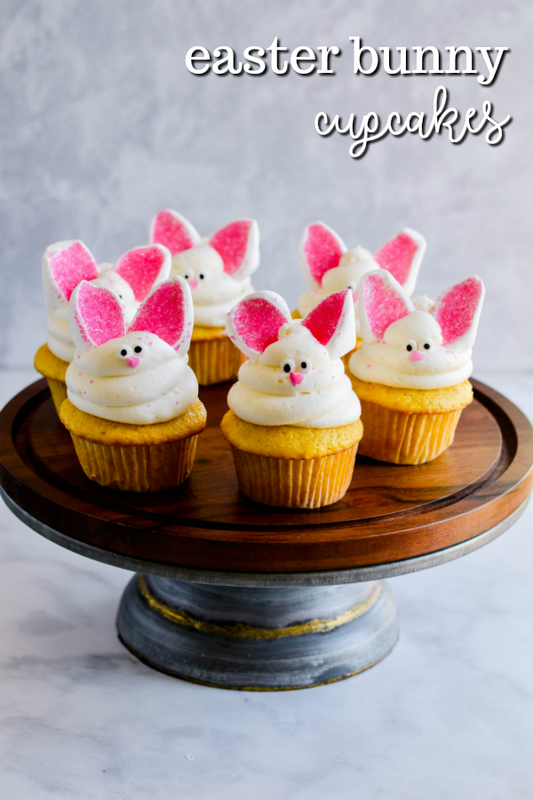 These Bunny Ear Cupcakes are super simple to make. 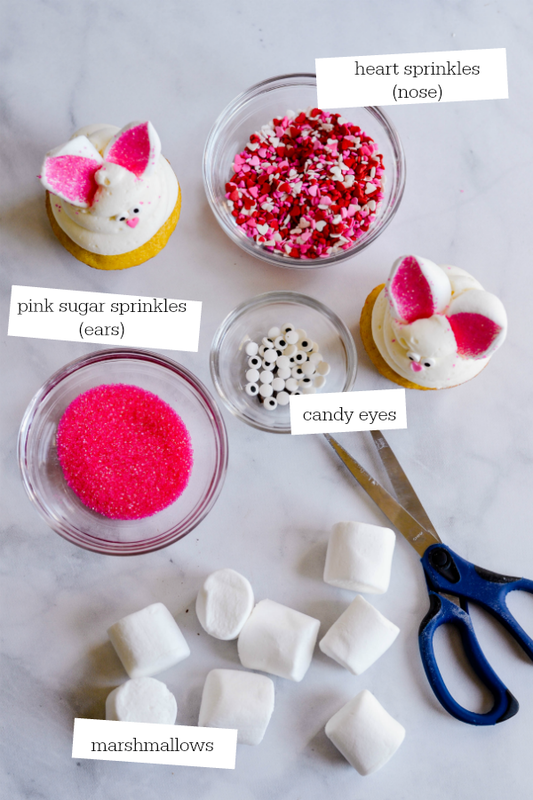 You can even put little hands to work making this fun Easter themed treat! 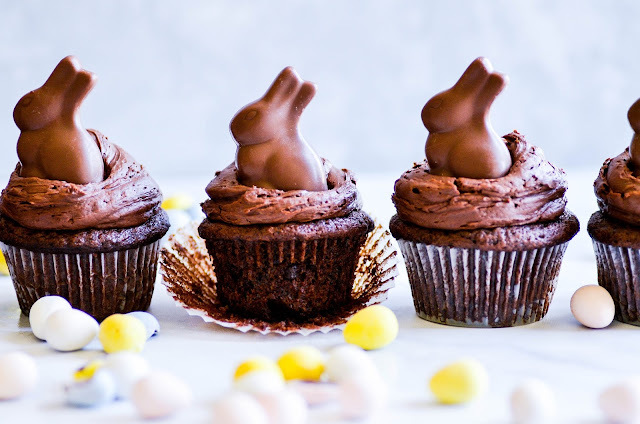 Check out all of our Easter Recipes here. Be sure to cut the marshmallows on a diagonal to create the right shape for bunny ears. Any small, pink candies will work for the noses. I like using heart-shaped sprinkles. You could use any white frosting, but I really liked this whipped cream cheese frosting for this particular cupcake. It's very light and airy, which makes it easy to press on the ears. I'm not providing a specific cupcake recipe below, because you can use your favorite (or even a cake mix!). But if you'd like to use my favorite vanilla cupcake, here's a link to the recipe. Use a stand mixer to whisk together the cream cheese and the powdered sugar, scraping down the sides as needed. Add the whipping cream and whisk on high until stiff peaks form. Pipe the frosting on the cupcakes in a large swirl. 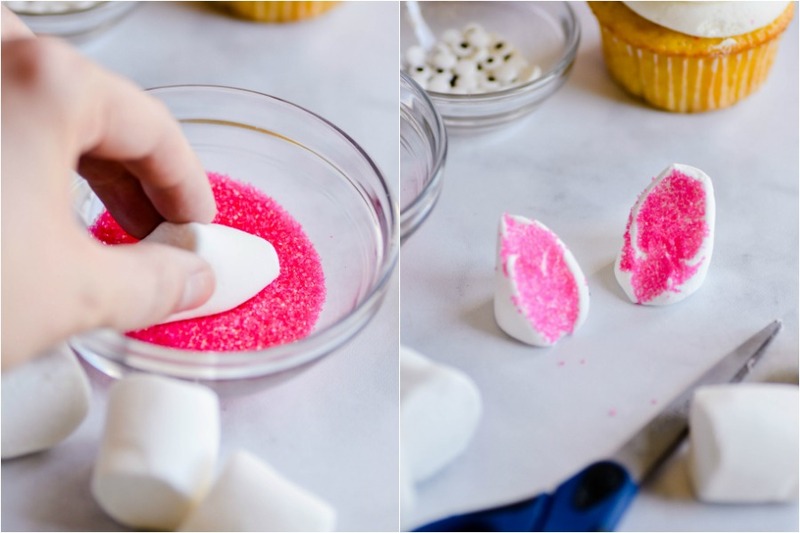 Prepare the bunny ears by cutting each marshmallow in half diagonally and dipping the sticky side in the pink sanding sugar (sprinkles). Make the bunny face by pressing the ears, eyes, and nose into place. 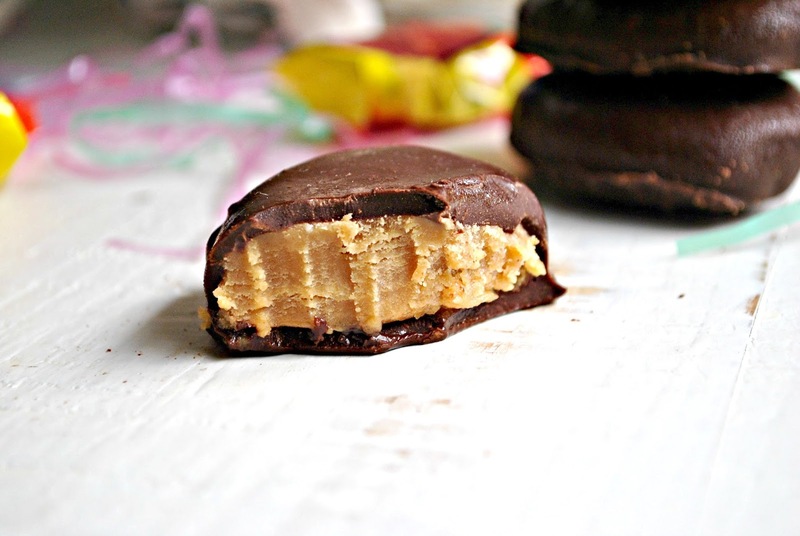 A classic Reese's Easter candy made in the walls of your own home! There are several candies that are Holiday iconic. Everyone has their Easter candy favorites. From peeps, to cadbury eggs, to robin eggs, there is a great selection to choose from. 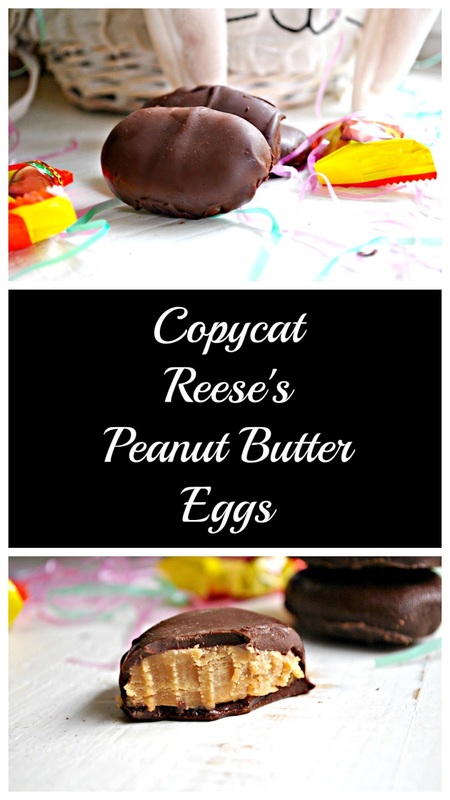 For me, the Reese's Peanut Butter Egg takes the cake, no doubt. Just using "takes the cake" made me imagine an entire Reese's Peanut Butter Egg Cake. Sheesh. That has to happen. Check back in next year and maybe I'll have one up! The chocolate and peanut butter duo rivals the great duos of all time. And no one really does it better than Reese's. I was surprised and ecstatic this recipe turns out the way it does. It really does replicate that Reese's Egg taste and texture. Enjoy! 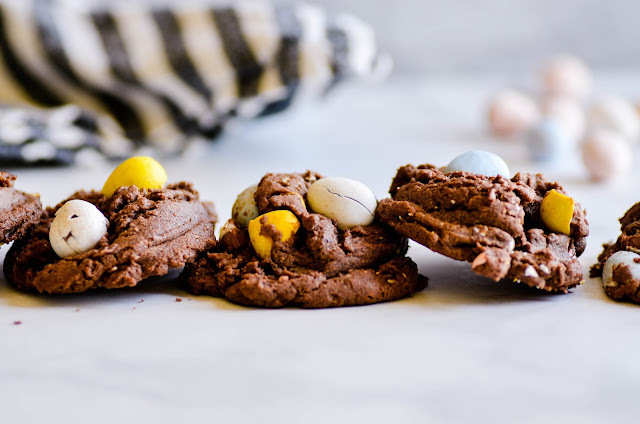 Soft and chewy chocolate cookies filled with crunchy Mini Cadbury Eggs. I packed my flour against the side of the container when I measured it, which resulted in the thick cookies pictured here. You can also use the "scoop and sweep" method, which will give you thinner, more even cookies. I know somebody will want to know if you can substitute the shortening with real butter-- the answer is that I don't know. I haven't ever deviated from this recipe. But if I had to take a guess, I'd say you're probably just fine to sub in butter. 1. Using an electric mixer, beat together the butter and shortening until smooth. Add the sugar and brown sugar, and mix until creamy. 2. Mix in the eggs, one at a time. 3. Mix in the vanilla, baking powder, baking soda, salt, and cocoa powder. 4. Mix in the flour until dough is uniformly brown. 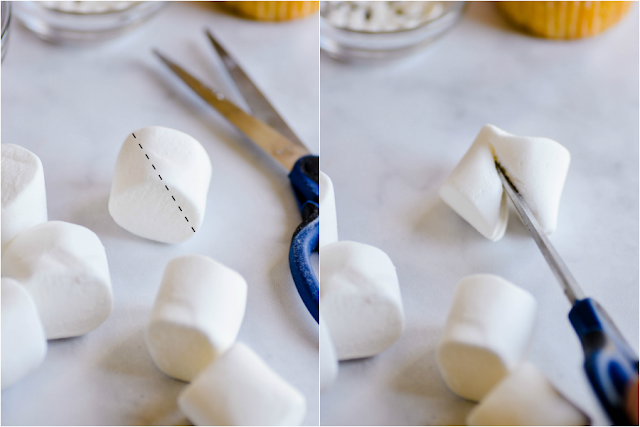 Fold in the crushed candy eggs. 5. Scoop dough (I used a 1-1/2 tablespoon scoop) onto ungreased cookie sheets and bake for 9 minutes. Allow to cool for a few minutes on the baking sheet before transferring to a cooling rack. 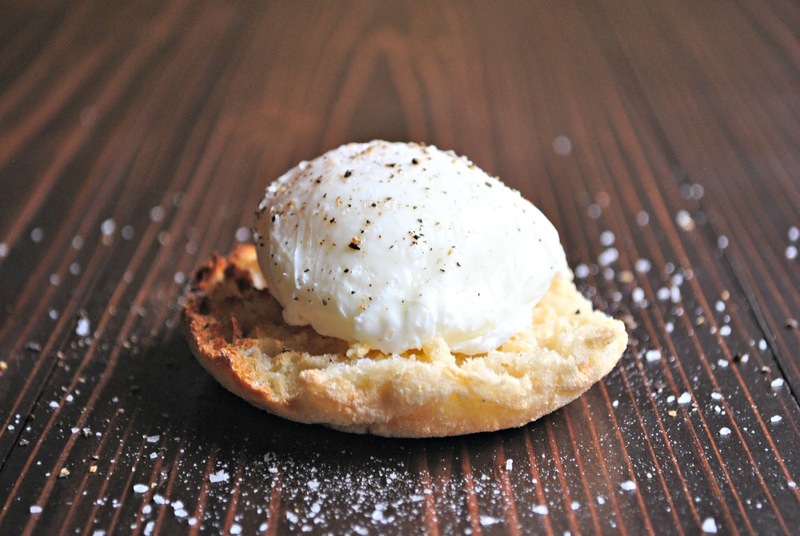 Gordon Ramsay's revealed method to execute a perfect poached egg for this classic breakfast treat. Close to two years ago I posted this Gordon Ramsay's Perfect Scrambled Eggs recipe, and it surprisingly has been one of our most popular recipes since. Seeing as our viewers have really appreciated the scrambled egg recipe, that conjured up a memory of a Gordon Ramsay's Master Chef episode I had seen a couple years back. To be honest, I hadn't ever had a poached egg before I saw this episode of Master Chef and wanted to try it (I know, we've never been the most sophisticated food family). I loved the way the yolk slowly ran out, and the egg white exterior had a smoother boiled egg texture. I hadn't had an egg like it before. His method is SUPER simple, and SUPER good. If you're trying to impress a spouse, friend, your family (or even yourself!) 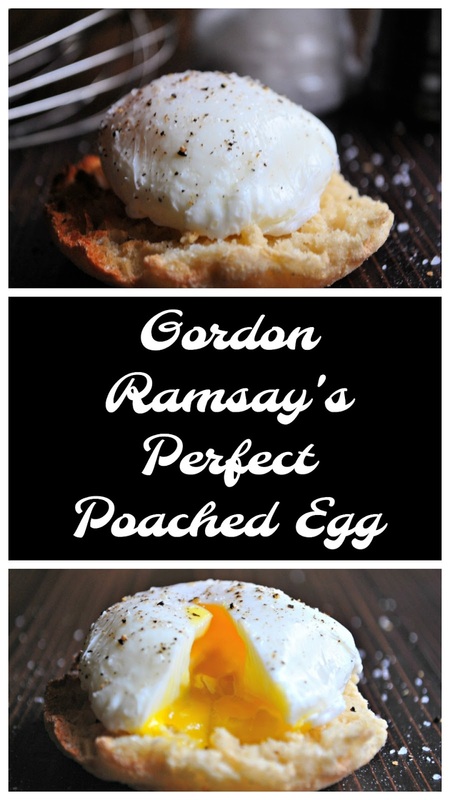 give this recipe a try for you egg lovers! Chocolate cupcakes topped with a whipped chocolate ganache and a miniature chocolate bunny. So cut for Easter! 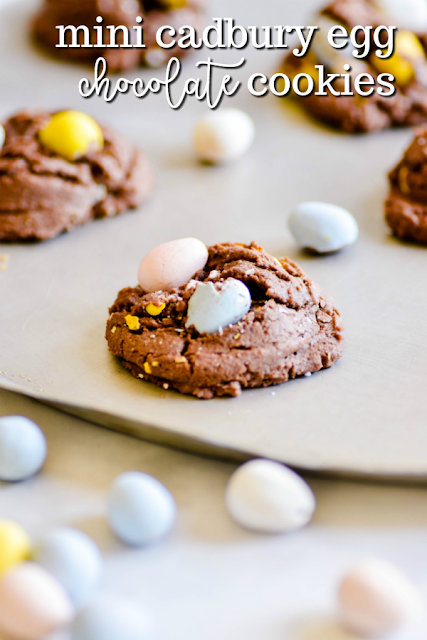 Check out all of our Easter recipes! Be sure to let the ganache cool completely before attempting to whip it into a frosting. Otherwise it won't fluff up. I used these Lindt Chocolate Bunnies (found at Target). I love the look of them, particularly because they are hollow. But Ghirardelli makes a pretty cute chocolate bunny too (I also found those at Target). Beat together all of ingredients until smooth batter forms, reserving the chocolate chips if using. Mix in the chocolate chips with a rubber spatula. Divide batter evenly in two (12-count) cupcake tins. Bake for 20 minutes, or until toothpick inserted comes out clean. Let cool completely. Over low heat (or in the microwave) heat the cream until bubbling. Remove from heat and add the chocolate chips. Whisk until smooth and melted. Let cool to room temperature (you can speed this up by placing it in the fridge for about 45 minutes, but don't let it get so hard that it's not easily scooped with a spoon). Transfer cooled ganache to a stand mixer, and use the whisk attachment to whip until fluffy, about 4-5 minutes. Add up to 1/2 cup powdered sugar and 1-3 tablespoons of milk to adjust the consistency if desired. 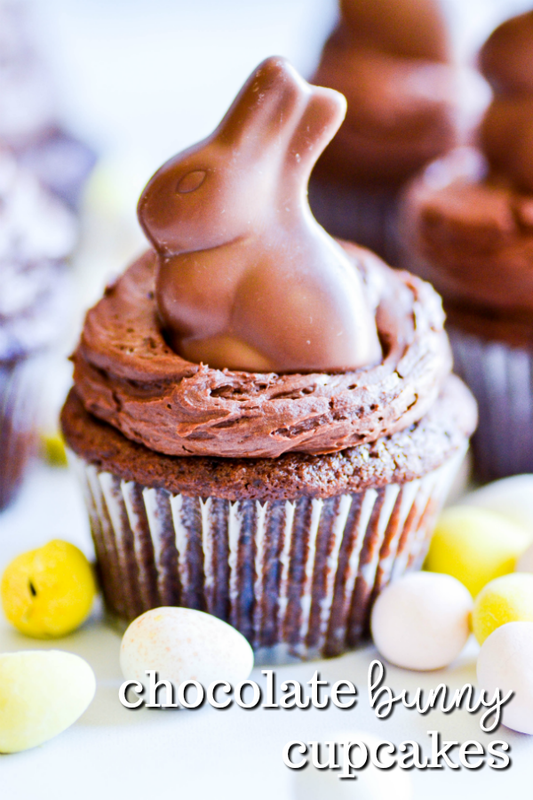 Pipe onto cooled cupcakes and top with chocolate bunnies. 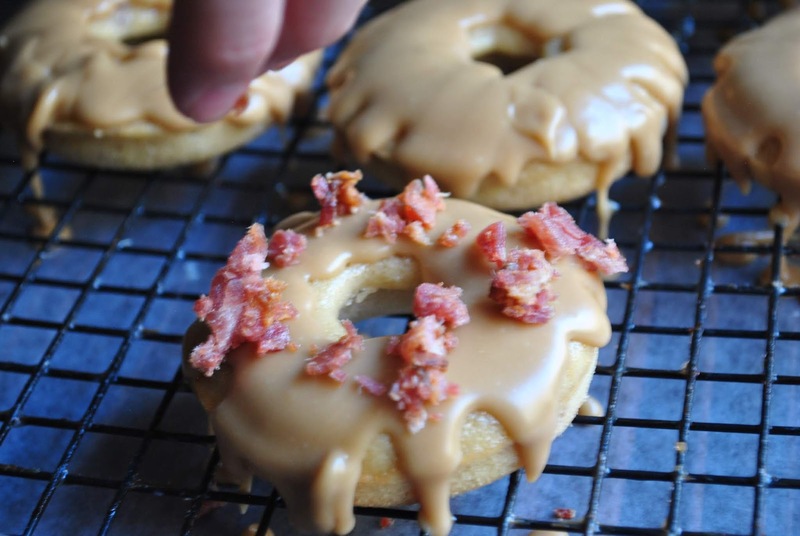 Donuts infused with maple, parmesan cheese, and real bacon bits, topped with a maple frosting and real bacon pieces. Are these donuts too much? You may be asking...I say no! I had the inspiration to make a donut like this when visiting Florida this Spring Break. We went to Maple Street Biscuit Company for the first time. If you've been there, you've probably heard of their "Squaking Goat" biscuit. A great biscuit, fried chicken, goat cheese, and a mango habanero sauce drenching the biscuit. We ordered one, and it was amazing. We also ordered the chicken and waffles and they were even more incredible! Their waffle has bacon and asiago cheese baked into it, so it provides just enough savor to balance out the sweetness of their waffle. 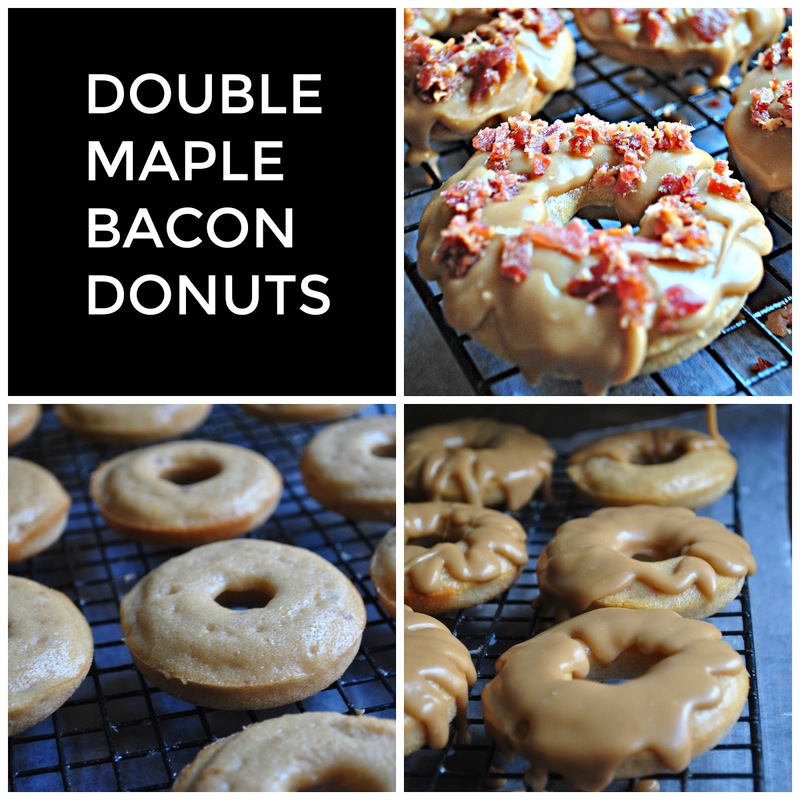 This meal made me think, "What if I make a maple bacon donut that has maple, bacon, and some savor from cheese, AND a maple frosting with bacon topping?". I tried it, and it did not disappoint!